Hello! I would like to make this post short and sweet. Easy you say? Well, let me explain. I have a handful of recipes that I am so excited to share with you—so much yumminess and health! Yay! The problem? I push these recipes aside because they often take much longer to put together than other posts. By the time I make the recipe, take pictures and upload them, write the post and recipe, etc, often a handful of hours have passed. However, eating well through the good real food I nourish my body with is one of the most important ways I take care of my health and maintain good control of my blood sugars and diabetes. My goal for 2013 is this. I wish to bring you more healthy and delicious recipes that you can add to your recipe box and health tool kit. You do not have to sacrifice taste when eating healthy. I have found healthier ways to make some well-loved recipes and fun treats without having to sacrifice good blood sugar control or health as a result. 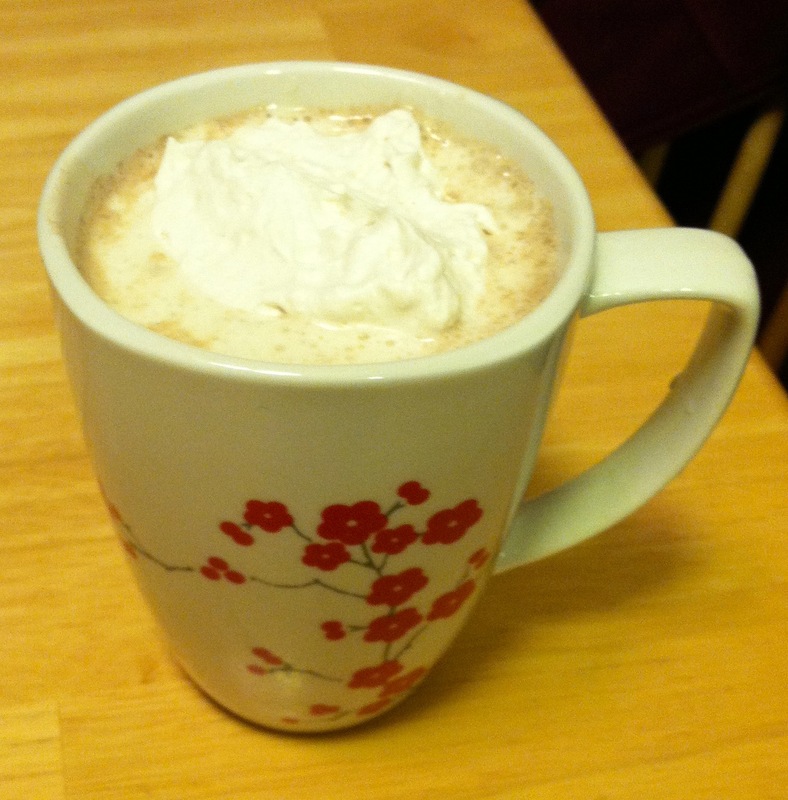 Like the hot chocolate recipe featured in this post! About the hot chocolate.. It had been a long while since I indulged in a good mug of rich hot chocolate that didn’t cause my blood sugars to go sailing upward after the first few sips. After multiple food allergies were recognized 4.5 years ago, most all hope for indulging in hot cocoa that didn’t contain corn or gluten became futile—even the varieties sold at the co-op contain cane sugar as the first or second ingredient. If you can eat cane sugar and do not experience a decline in the blood sugars you desire, all the power to you! (Although they are saying consuming an excessive amount of cane sugar is not good for anyone, diabetes or not). In the last few years I have had an increasingly difficult time keeping my blood sugars in check when consuming cane sugar, especially sugar in liquid form. Several years ago I stumbled upon a recipe online for gluten free hot chocolate. I changed the recipe, making it more healthy and d-friendly and a little easier to make. 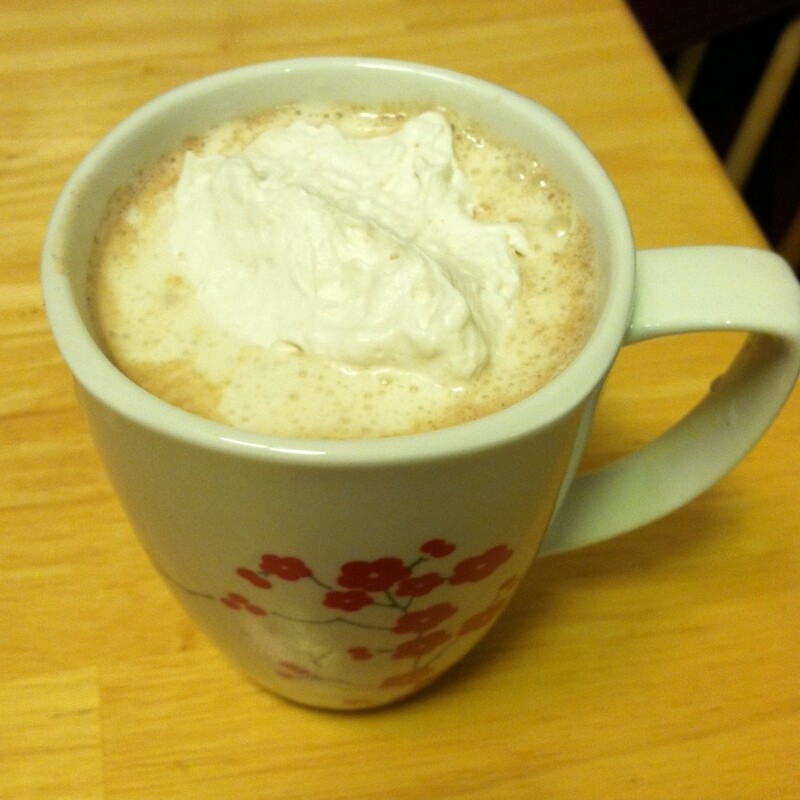 I am pleased to present you with my recipe for homemade D-friendly hot chocolate. It is the best hot chocolate I have ever enjoyed. Not too sweet to dominate the palette with sugar overload but just chocolatey enough to be deeply satisfying. Enjoy! Feel free to substitute whatever kind of milk you drink – cow, rice or coconut if you do not drink almond milk. 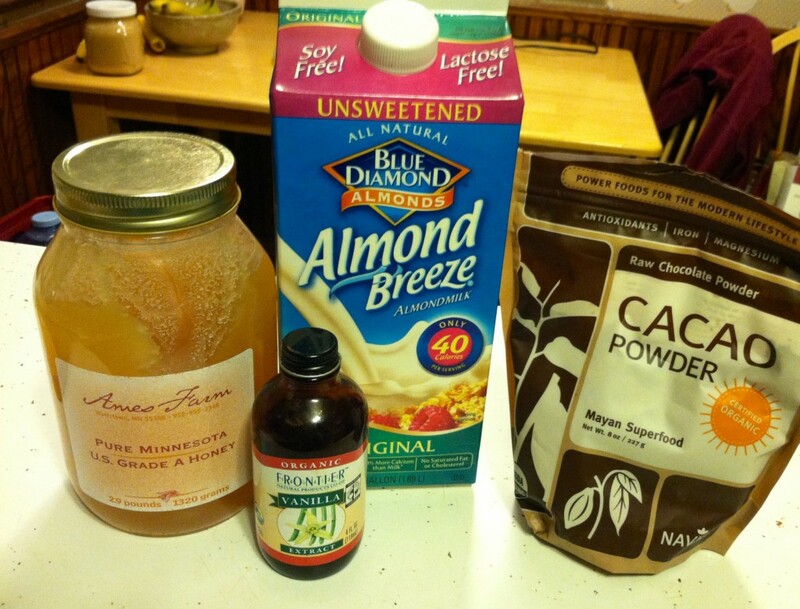 Unsweetened almond milk is a nice option because it has only 1 gram of carb for an 8 ounce serving. If you are looking to reduce the amount of sweetener further, feel free to experiment reducing the amount of honey and replacing with several drops of stevia (respectively, add more sweetener if you find it not sweet enough). I like honey better than white cane sugar as it is more natural and offers a much less dramatic rise in my blood sugar. Add whipped cream or marshmallows before serving for a delicious treat (this also makes it a little less D-friendly but is oh, so worth it in my opinion!). You could also make a homemade low sugar whipped cream to use for topping your cocoa. [EDITOR’S UPDATE: LOWER SUGAR/CARB OPTION: I just made this using 2 tablespoons honey and 16 drops liquid NuNaturals Stevia. It is delicious and definitely sweet enough. I added a spoonful of Organic TruWhip before serving which sweetens it up more. Without any add-ins on top (whipped cream or marshmallows) you may wish to add 20+ drops of Stevia in addition to 2 Tablespoons honey]. Add 4 cups almond milk to large saucepan. Add 1/4 cup cacao powder and 1/4 cup honey. Whisk until blended. 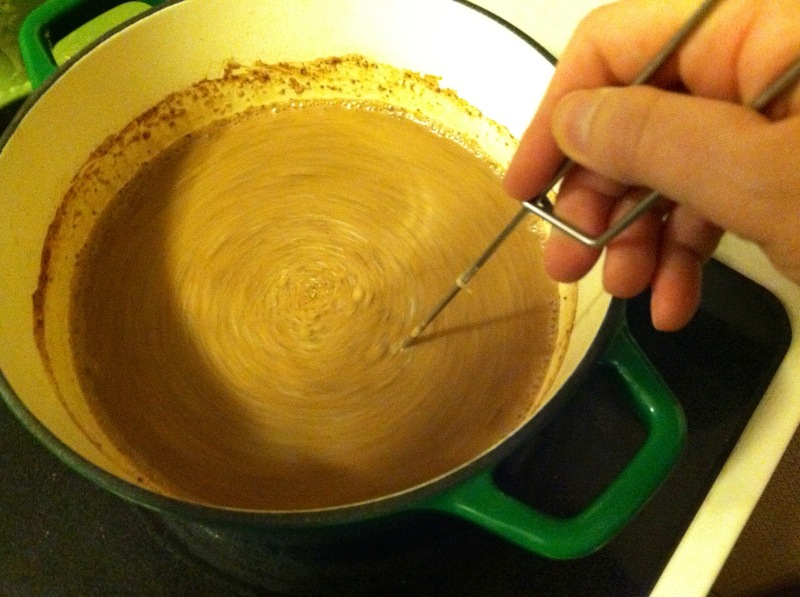 Heat over medium whisking often so milk does not burn. Once it becomes hot (you will see steam rising), add 2 teaspoons vanilla. Whisk again. Use ladle to serve into 4 mugs. Top with a dollop of whip cream or a small handful of marshmallows. Also delicious served without! Enjoy! Refrigerate any unused portion and reheat on stovetop the following day making sure to whisk in the settled chocolate before serving. You may halve the recipe to make less servings but I love having an extra serving left over to enjoy the next day! Yummy! I will be making this soon! We had this today–delicious! Kids liked it very much too. Yum! I will have to try this out! And to answer your question, we had Swiss Miss in California! I LOVED that stuff as a kid!